Taken from the classic fish cookbook from Rick Stein, “Seafood Lover’s Guide”. This Salmon en Croute with Sultana and Ginger Stuffing recipe turns Salmon into ‘food from the Gods’. Rick’s recipe is to serve 6 using 2 large fillets with the stuffing in the middle, but just adapt the recipe, as Erik does, using the smaller size salmon fillets for individual portions. Pre-heat the oven to 200°C / 400°F / Gas Mark 6, and put a large baking sheet in the oven to heat up. Season the salmon fillet well with salt. Mix the softened butter with the stem ginger, Sultanas, mace, 1/2 teaspoon of salt and black pepper. 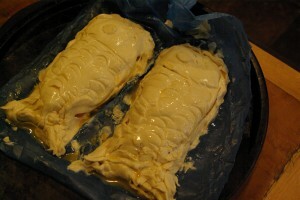 Spread the inner face of one salmon fillet evenly with the butter mixture and then lay the second fillet on top. Defrost the pastry if frozen, according to instructions on packet, or take out of the fridge again reading the instructions on the packet (usually about 20-30 minutes. When ready to roll, cut the pastry in half and roll one piece out on a lightly floured work surface into a a rectangle about 4 cm (1 1/2 inches) bigger than the salmon all the way around. Roll the second piece out into a rectangle 5 cm (2 inches) larger than the first piece of pastry all the way round. 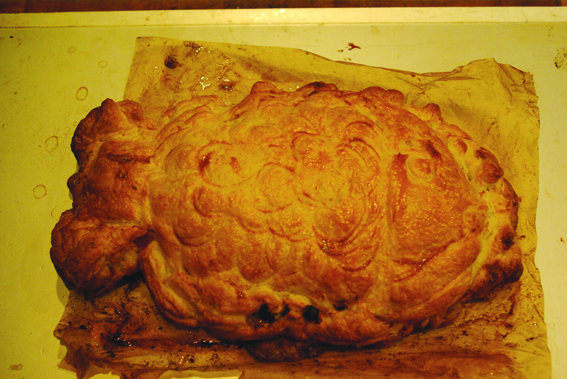 Lay the smaller rectangle of pastry on a well-floured baking sheet and place the salmon in the centre. Brush a wide band of beaten egg around the salmon and lay the second piece of pastry on top, taking care not to stretch it. Press the pastry tightly around the outside of the salmon, trying to ensure that you have not trapped in too much air, then press the edges together well. Trim the edges of the pastry neatly, to leave a 2.5 cm (1 inch) band all the way around. Brush this once more with egg. Mark the edge with the tines of a fork, and decorate the top with a fish scale effect by pressing an upturned teaspoon gently into the pastry, working in rows down the length of the parcel. Chill for at least an hour in the fridge. Remove the Salmon En Croute from the fridge and brush it all over with the beaten egg. 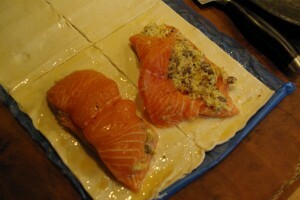 Take the hot baking sheet out of the oven and carefully slide the salmon parcel on to it. Return to the oven and bake for 35-40 minutes. Leave it to rest for 5 minutes. Transfer the salmon to a warm serving plate, and if in one large piece, slice it across to serve. If you make individual ones, like Erik, just place each one on a warm serving plate. The Salmon En Croute with Sultana and Ginger Stuffing is paired brilliantly with New Potatoes in a Herbed, Butter glaze, and we love it served with Hollandaise Sauce and a crispy green vegetable. Seriously Excited about Sat Bain’s Magnificent First Cookbook. Downsize Diary Weeks 3, 4, 5 ………..